Is it time to delete your Facebook group? Groups can be a valuable asset to your business marketing but they don’t always work out the way you planned. If you have a large membership, they can be extremely time-consuming. Unless they are contributing to a specific business goal, it’s hard to justify keeping them alive. In this post, we’ll look at how to delete a Facebook group as well as some alternatives to pulling the plug. Deleting your Facebook group is drastic and final. Once you’ve done it, there’s no going back. You’ll lose all the content and threads. All the work you put in will be gone for good. So before you delete, consider the other options. If you are 100% sure you want to delete scroll down to point 4. Instead of deleting could re-branding the group work? It can be disheartening when you grow an engaged group but members constantly recommend your competitors in their comments. Usually, this is because you didn’t make it clear that the group is owned by your business when you set it up. If so, a re-brand could fix the problem. Change the group name, add branding to your cover images, and link it to your Facebook page. Here’s how. Change your Facebook group name to the new branded version. Your group cover image size is 1,640px by 859px. Use Canva, or your preferred graphic design tool, to create a Facebook group cover that includes your logo. Linking your page to your group lets you post, like and comment as your page on your Facebook group. Friendships form in groups– members make real connections and support each other. Deleting the group and destroying these relationships can end in hurt feelings and damage your reputation. Instead of deleting, offer to hand your Facebook group over to new Admins. Look for active members in the group who might want to take on the role. If you hand the group over to new admins, disconnect the group from your business and consider renaming it so that members can see there has been a change. What is your Instagram password when you login from Facebook? I've created my Instagram account by logging in through Facebook. Now whenever I have to log in from a laptop or a PC they say my password is incorrect (since they don't have a "login with Facebook option"). I tried using my Facebook password but it didn't work. What to do? When you login account using Facebook it synchronize your account with Facebook by using details from Facebook and didn't ask for password. But when you login account from a separate device or PC, it will ask for the password. If you can't remember your password, you can reset it through your email address or your Facebook account. To reset your password, first tap Forgot? next to Password on the log in screen. To reset through your email address, tap Username or Email, enter your username or the email address you used to create your account and tap search. Choose Send a Password Reset Email. To reset through Facebook, tap Reset using Facebook. You may be asked to log into Facebook. You can then enter a new password for the Instagram account that was most recently linked to your Facebook account. If you can't access the email you registered with and you didn't link your Instagram account to Facebook, we're not able to give you access to this account. For above activity I would suggest instead of app, go to instagram.comand change password. Go into the app where you originally signed up and click the option to change your password and then set one there. Not the answer you're looking for? Browse other questions tagged or ask your own question. The British army is creating a special force of Facebook warriors, skilled in psychological operations and use of social media to engage in unconventional warfare in the information age. The 77th Brigade, to be based in Hermitage, near Newbury, in Berkshire, will be about 1,500-strong and formed of units drawn from across the army. It will formally come into being in April. The brigade will be responsible for what is described as non-lethal warfare. Both the Israeli and US army already engage heavily in psychological operations. Against a background of 24-hour news, smartphones and social media, such as Facebook and Twitter, the force will attempt to control the narrative. The 77th will include regulars and reservists and recruitment will begin in the spring. Soldiers with journalism skills and familiarity with social media are among those being sought. The move is partly a result of experience in counter-insurgency operations in Afghanistan. It can also be seen as a response to events of the last year that include Russia’s actions in Ukraine, in particular Crimea, and Islamic State’s (Isis) takeover of large swaths of Syria and Iraq. Read moreNato has so far been unable to find a counter to what the US and UK claim is Russia creating unrest by sending in regular troops disguised as local militia, allowing president Vladimir Putin to deny responsibility.Isis has proved adept at exploiting social media to attract fighters from around the world. The Israel Defence Forces have pioneered state military engagement with social media, with dedicated teams operating since Operation Cast Lead, its war in Gaza in 2008-9. The IDF is active on 30 platforms – including Twitter, Facebook, Youtube and Instagram – in six languages. “It enables us to engage with an audience we otherwise wouldn’t reach,” said an Israeli army spokesman. Wondering how to change your Facebook Page URL? It’s pretty simple, though you may find at every turn, Facebook says you can’t. I checked all of the Pages I admin, and the option to change the Page URL was readily available. Here’s how. NOTE: Here are the instructions if you need to change your Facebook Page NAME, instead of URL. What’s your Facebook Page URL? Your Facebook Page URL is the part of your web address after the https://www.facebook.com/. So in the case of my Fan Page, we’re talking about the LouiseMcom. Facebook calls this your username. It’s also often referred to as your vanity URL. Not surprisingly, Facebook has a host of rules about usernames. You can’t claim a username someone else is already using. Your username should be as close as possible to your true name or the name of the business or person your Page represents (ex: John.Smith, Facebook). Choose a username you’ll be happy with for the long term. Usernames are not transferable and you can only change your username once. Usernames can only contain alphanumeric characters (A-Z, 0-9) or a period (“.”). Periods (“.”) and capitalization don’t count as a part of a username. For example, johnsmith55, John.Smith55 and john.smith.55 are all considered the same username. Usernames must be at least 5 characters long and can’t contain generic terms. Regarding periods and capitalization, decide how you want it to look in the address bar, because users can type it in with or without periods and capitals. I did see one article claiming that periods between words makes your URL more SEO friendly, as Google likes delimiters between words. I decided to go with just one period, as I thought it was more user-friendly. Maybe you’ve decided your URL is too long, or you want to make it match your Page Name. Ready Set Vacation!” is a useful travel preparation app. Browse suggestions for tours and activities already prepared for your destination and book them in advance. The homepage has a simple yet beautiful countdown that tells you how many weeks, days and hours you have left until that long awaited vacation starts. You can share a screenshot with friends or check the widget on your home screen. Don’t forget a thing with the integrated vacation checklist and always stay informed by the built-in temperature and weather indicator. Hotfix: the weather for Antigua and Barbuda is now working correctly. Let me help you to get your account back. just follow the following steps and get your account back within 24 hours. First of All you should open the Facebook website www.facebook.com And enter your ID/E-mail address or Mobile No. on which your Account and also your Password and just click on the Log In button. As you Log In such a window will be open as given below. Then If you have forgot all the detail which you have given in your Facebook Account then you should download those info from here by clicking on the Download Your Information button and then click on Create File . After that you should choose the folder where you want to save these detail. It will download in Zip folder you should Extract it. This downloaded information provides you, your profile details and also all other details even about your friends and posts etc. After that, click on Back, and then click on Go To Help Centre at the left side of the pup window. Or other documents which have issued through Govt. and have your full name, Picture and Date of Birth as it is mandotary in this case. Then just click on the Send Button and your Appeal have been send. You should submit your appeal just one time ant wait until Facebook reactivates it, it may take time of 3-9 days for them to reactivate an account in general. So after submission of appeal check your email on daily basis which you have connected to that particular Facebook account. See how your visitors are really using your website.Hotjar is a quick and easy way to really understand your website visitors. Try it for free! Originally Answered: How do I unblock my profile on Facebook? Don’t Open your Facebook account up-to 96 hrs. Clear the cache and stuff like history etc. It may be back to normal. If you still can’t, go through the automated security verification process. May be Facebook has detected some suspicious activity and your account got locked. In such cases,You can verify by confirming your mobile number. Facebook will send you a code, you need to enter and verify your Facebook account. Once you have verified, you may able to unlock your Facebook account.Account authenticity: Facebook will give you an option to verify by identifying the photos of your friends. You need to identify at most five photos to unlock your Facebook account. You will be provided with two lifeline, in case you didn’t able to identify your tagged friend in one go.Once you have succeeded in identifying the tagged photo of your friend, you will be welcomed with a message “Account verified congratulation!”You have to click continue to proceed for the next step. You will be asked your current email address or you can go with your new email address.You will be asked to enter a new security question. Enter your preferred security question and at last your Facebook account get unlock. Further, you can proceed with unlocked Facebook account by logging in. If you think, your Facebook account was locked or disabled by mistakes. No worries, you can submit an appeal to Facebook by clicking here. You have to identify your identity by submitting ID card, which must include your name and date of birth. Facebook will give you an option to identify yourself. Firstly, you can submit any government issued ID that must contain your name and date of birth. The option 1 includes: Birth certificate, driver license, Passport, Marriage certificate, Voter ID card, Green card and for more options you can click here.If the above option doesn’t suit for any reason or you didn't have above listed ID, you have to provide two different ID. The name contain in your ID must match each other. Also, one of your ID proof must contain photo or date of birth. The option 2 includes: bank statement, bus card, credit card, Library card, school card, utility card and for more options you can click here. Remember, before submitting documentation such as credit card or social security number you should cover up personal information. When you are about to create free email account at mail.com there are few things worth considering. First of all, before you create email account think of your username. Will you use your email as private or professionally? Make sure your username defines your purpose. Next thing is the domain you are going to use. mail.com lets you choose from over 200 domains! Running a business? You can choose: consultant.com, engineer.com and many more for example. What is your hobby? Make sure to say it loud for example with: artlover.com or bikerider.com. Surely, mail.com’s wide choice of domains will meet your needs. That's it! You're done. Enjoy your new email account immediately on any device of your choice! What comes with your mail.com free email account? FACEBOOK is the most popular social media platform in the world, with more than one billion people logging in every day to check their feed. Facebook has recently improved security to protect its users from hackers, but what do you do if you forgot your password? How do you reset your Facebook password? Facebook has grown to become one of the most recognisable brands in the world, with more than one billion people having an active account. Social media is a massive part of modern day culture, with users expecting tighter security for their personal accounts. Facebook has plenty of security options in place to protect its users, but what happens if they forget their password? Hackers can gain access to your Facebook account through correctly guessing your password, so it is recommended to change it regularly. If you have recently changed it and can’t remember its, or you have forgotten a previous Facebook password, here is how to change it and log back in. It is likely you are one of the hundreds of millions of people whohavea Facebook account to connect with friends online. If you are trying to login to your account, go tohttps://facebook.comto bring up the login page. Ensure that no one else is currently logged into Facebook on your computer before entering your email address and password into the login boxes in the top right-hand section of the tab. If someone is logged in, simply click at the top right of the Facebook page and select log out to sign the person out. Facebook messages are a great way to keep in touch with your friends, except for one thing. A few years ago, Facebook separated messages from the main Facebook app on mobile. So if you’re on your phone and want to check a new Facebook message, you can’t—unless you also have Facebook Messenger installed. For most folks, that’s not an issue. They’ve downloaded Messenger and love it. However, for those of us steadfastly determined not to use or download Messenger, that means missing out on timely Facebook messages. Or does it? Turns out, there are a few ways you can check your Facebook messages without having Messenger installed. You just have to use your phone’s browser. The easiest way is to head to Messenger.com. On the desktop, this site acts as a messages-only portal. If you open it on your mobile browser, though, the site will redirect you to downloading the Messenger app. The workaround: In your browser settings, tap “Request desktop site.” On iOS, you can find this setting by tapping the share button in Safari. On Android, tap the three dot menu icon in the upper right-hand corner. There was a time when deleting your Facebook account was a pie-in-the-sky fantasy, but this week’s news might have you thinking twice. In a series of reports, we learned that an employee at Facebook erroneously handed a trove of data to a company called Cambridge Analytics, which in turn used that information to target voters and spread influence ahead of the 2016 election. So we totally understand if you’re having second thoughts about your account. The good news is, you have options. First you can limit what third-party apps and the Facebook community can see about your account. If that’s not enough, you can deactivate your account, which can be undone, or full-on delete it—and even then, you have a chance to change your mind. Here’s how it works. If you want to take your Facebook account private, you’ll need to switch your privacy settings from Public to Only Me. You can also limit the data that third-party apps can access. Also in the Settings menu, click on the Apps tab. You’ll see a list of the apps that are connected to your account, which could be dozens or even hundreds if you’ve had an account for a while. Next to each app you’ll see a small “X” in the upper right corner that will remove it from your account. For apps that you want to keep, you can click on the edit button to limit some of its access to your account. How can a company sign up for Facebook at Work? Currently Facebook at Work is in testing phase. It means sign up is not open to all companies. Those companies who wish to test Facebook at Work need to send a request via the link " https://www.facebook.com/help/co... ". If they accept your request, you can go ahead and signup with the URL they provide to you. Help page of Facebook at Work says "If you'd like to create a work account but your employer isn't using Facebook at Work, let us know so we can send you more information." They always contact and ask if you need help with the implementation to your company what is a big plus. If your company doesn't use Facebook at Work yet and it wants to start using it, then you need to fill out the form here https://www.facebook.com/help/co... and ask Facebook to do it. Why pay more for email features that should be included for free?iContact email marketing has easy-to-use features, top-rated support, and affordable pricing plans. Is there a different application form for CAN+? No. Simply apply for a visitor visa online or on paper. For paper applications, check the document checklist for full details of what you need to submit with your application. Visa application centres are not involved in the visa decision-making process and can’t provide advice to applicants. All decisions on applications are made by visa officers at Immigration, Refugees and Citizenship Canada visa offices. Applications that meet the criteria will also be processed faster. Do I need a Canadian visa if I have a United States visa? I am visiting the U.S. I want to come to Canada. Do I need an eTA? Do I need a visa if I am travelling through Canada without stopping or visiting? I am travelling with my minor child without my spouse. What documents must I present? Facebook has logged 50 million users out of their compromised accounts today, along with 40 million more as a precaution, and frankly you might want to just not bother logging back in again. This latest forced detox from the increasingly controversial social network comes as Facebook admits a security glitch in one of its profile privacy features could’ve allowed hackers to gain access to the accounts of millions. The irony that it’s the “View As” tool – specifically designed to give users more visibility as to what exactly they’re sharing and who can see it – which was compromised by attackers is, I suspect, something Facebook engineers aren’t quite ready to laugh about yet. The social network itself was responsible for the loophole, inadvertently creating it last year with changes to its video upload system. Now it’s been fixed, and an investigation begun, but the damage may already be done. For Facebook users, the first signs of something amiss will probably be when you try to access the social network today. Facebook has reset the access tokens – the way by which you’re “remembered” by the site on a device, and thus don’t have to log in every time – of 90 million people, and so they’re going to have to scratch their heads and try to recall their password. The promise is also that there’ll be a notification explaining what went wrong and what Facebook is doing. “After they have logged back in, people will get a notification at the top of their News Feed explaining what happened,” Guy Rosen, VP of Product Management at Facebook, said today. We’ve heard at least one report of someone needing to log back in and not seeing that message, however, though it’s unclear whether they were logged out because of this particular attack or for another reason. The hack – or “security issue” as Facebook would rather describe it – couldn’t really come at a worse time for the site. A federal probe potentially including the FBI, SEC, FTC, and DOJ is reportedly underway in the US, examining how Facebook handled private data that was used by Cambridge Analytica to allegedly help sway voters in the 2016 US Presidential election. Some politicians are already calling for new regulations to be applied. Just this week, meanwhile, it was revealed that Facebook has been using the cellphone number people signed up to two-factor authentication (2FA) with for advertising purposes. 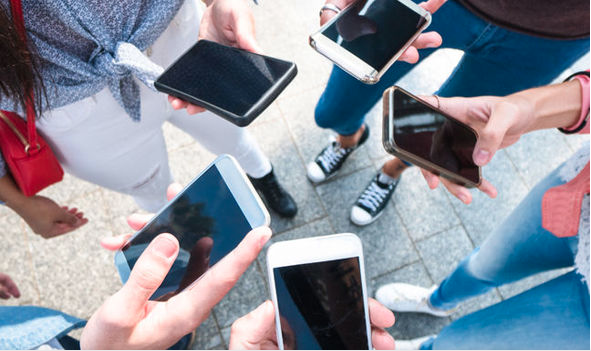 Another investigation showed just how one Facebook user could inadvertently be allowing all of their friends’ data to be tapped for adverts too. I can’t help but think that this is all a strong hint that it might be time to cool off our relationship with Facebook. Hacks happen, certainly: wherever there’s a sizable cache of user data, there’ll be a group of people eager to get their hands on it however they can. That, though, combined with the mercenary way the site deals with information shared with advertisers, though, is an altogether tougher thing to stomach. I’ve been weaning myself of Facebook over the past twelve months, though I haven’t gone quite so far as to delete my account altogether. Facebook itself, ironically, has done the most to encourage my reduced use. The sluggish iOS app and the interminable time it takes for the timeline to load every time I try to access it on my iPhone means often I end up exiting before any new posts show up. I can’t say I particularly feel like I’m missing out on anything, either. Scrolling through the timeline was increasingly feeling like wading through a bad vision of the mall of the future in a science-fiction movie, all attention-grabbing adverts and videos shouting my name and getting in the way of the reason I was actually there. Meanwhile, Facebook’s increasingly thirsty notifications remind me of friends’ birthdays and anything especially popular. It’s up to you whether you publicly announce your decision to abandon Facebook, or just allow it to fade away from your daily routine, as I have. Maybe I’m missing out on hearing every little update in my friends and family’s life, but in the grand balance of things I think I’m okay to compromise on that. And, while I wasn’t in the 90-million-strong group of people given an untimely reminder of just how much they share through Facebook in this current hack, I almost feel a little disappointed not to have been given the nudge to just stay logged out that they’ve received today. Facebook has reset the access to 90 million user accounts after finding a security breach, forcing the affected users to log back into their accounts, the company announced Friday. The breach allowed hackers to access other people’s accounts, and directly affected 50 million of those accounts. The company said that it doesn’t yet know whether the breach was used by anyone to access any personal information, including private messages, from those 50 million Facebook users without their knowledge. It did confirm that hackers were able to access profile information, including age, gender, and place of residence, but that they didn’t have access to any credit card information. Facebook clarified during a second call with media Friday afternoon that the breach also potentially gave hackers access to third-party apps and websites that use Facebook’s login, including the company’s own Messenger and Instagram apps. 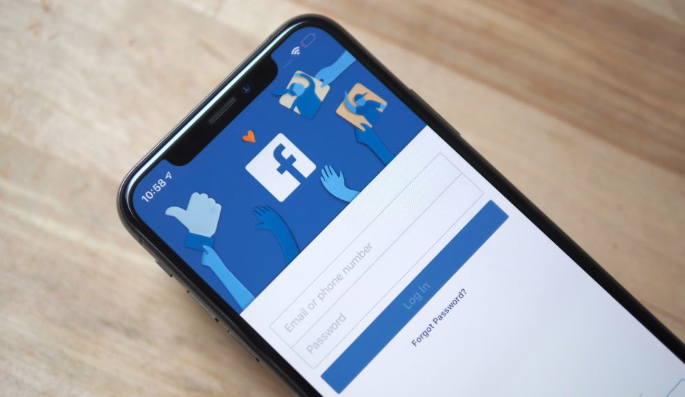 Users who find themselves unable to log into third-party apps with their Facebook accounts may have to disconnect those apps from their account, and then reconnect them to regain access. Facebook said that it was working with the FBI and other law enforcement agencies to help investigate the breach. At the center of the hack was a Facebook feature that allows users to view their own Facebook page the way other users with different access levels — friends, family, or unknown users — would see it. This “view as” feature could apparently be exploited to also steal access tokens to take over third-party accounts. “We’re temporarily turning off the ‘View As’ feature while we conduct a thorough security review,” Rosen wrote Friday. 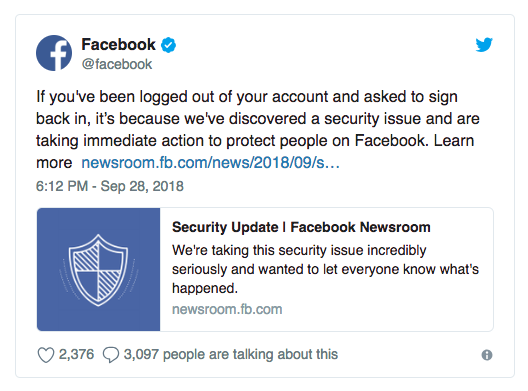 Users who have been affected by the breach will have to log back into their Facebook account, and the company said that it would post a note atop of their newsfeed explaining the situation. Rosen explained during Friday’s call that the company inadvertently introduced three bugs when it updated changes to its video uploader in July of 2017. However, the company didn’t discover that these bugs could be used to hack its system until this week. It informed law enforcement about it on Wednesday, and disabled the vulnerability late Thursday. The company decided to disable access tokens for another 40 million users as a precautionary measure because it found that the profiles of those users were browsed with the “view as” feature enabled. However, this could have also been a legitimate use of the feature. Facebook does not yet know whether the hack was initiated by nation-state actors, but Rosen said Friday that the 50 million users targeted were seemingly a broad slice of Facebook’s users. The company did notify European authorities about the breach, something that it is required to do under Europe’s new privacy laws if European users were affected. Unknown attackers accessed 50 million Facebook accounts this month, and executives said Friday that any potentially compromised accounts had been logged out of the service as an investigation continued. In a blog post, Facebook executive Guy Rosen said that the social network’s “view as” feature, which lets users see their profile page as a specific user would, allowed access to that other account’s “token,” or identification. The hackers found that a video uploader coughed up a friend’s token within a “Happy Birthday” option that was not supposed to be active in “view as” mode, and then would use the trick against more friends of the accounts they accessed. Facebook actually logged off 90 million users Friday, executives said: The 50 million affected accounts and another 40 million that had used the ”view as” feature since a July 2017 update caused the security hole. Users who were logged out were promised notifications with more information at the top of their pages when they regained control of their account. On the morning conference call, Facebook assured the media that credit-card numbers could not have been accessed, but repeatedly stressed that it was early in the investigation when questioned about other parts of a user’s accounts, such as private messages. Facebook began investigating on Sept. 16, after noticing unusual account activity, and discovered the vulnerability on Tuesday. By Thursday evening, they had patched it and begun forcing users out to require a password for entry. Facebook said the vulnerability is fixed, law enforcement has been notified and the breach has been disclosed to the Irish Data Protection Commission to satisfy a GDPR requirement to notify within 72 hours. The company will turn off the “view as” feature temporarily. “While I’m glad we found this, fixed the vulnerability, and secured the accounts that may be at risk, the reality is we need to continue developing new tools to prevent this from happening in the first place,” Chief Executive Mark Zuckerberg said in a post on his Facebook account, which was reportedly one of the 50 million affected. Facebook’s stock FB, -2.59% took a hit directly after the breach was announced, and closed down 2.6% on the day. Shares have declined 6.8% so far this year amid other data scares, such as the Cambridge Analytica scandal, and the increasing costs Facebook is facing to confront its issues. The S&P 500 index SPX, +0.00% has gained 9% in 2018. 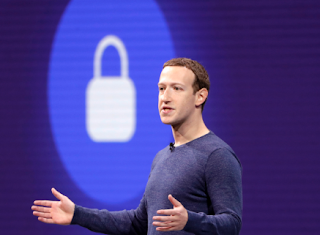 The breach is likely to increase pressure on Facebook, which has already faced blowback from politicians for earlier privacy issues. U.S. Sen. Mark Warner, a Virginia Democrat, called the breach “deeply concerning” in an email statement Friday. 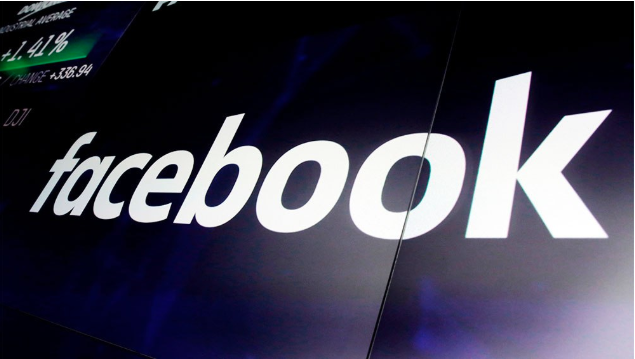 Facebook said it discovered a security breach that affects nearly 50 million user accounts. According to the company hackers exploited the 'View As' feature on the service and steps are being taken to fix the security problem. Facebook shares tumbled Friday, along with other social media stocks, after the company disclosed it had uncovered a security issue affecting about 50 million accounts, in which attackers stole Facebook access tokens through its “view as" feature. The attackers could use these tokens to take over people’s accounts. CEO Mark Zuckerberg, addressing the breach during a call Friday afternoon, called the attack a “serious issue.” During the call, the company said it is working with the FBI and is unsure who is behind the attacks. Facebook’s "view as" feature allows users to see what their own profile looks like to someone else. The company said that it hasn’t determined whether the accounts were misused or if any information was accessed. "Since we’ve only just started our investigation, we have yet to determine whether these accounts were misused or any information accessed," the company said in a blog. The company said it has fixed the vulnerability in its code that allowed attackers access and has informed law enforcement. The company is temporarily turning off its “view as” feature while it conducts a security review. Facebook has temporarily reset access tokens of almost 50 million accounts and as a precaution, is resetting access tokens for another 40 million accounts. The social media giant said it will continue investing heavily in security. 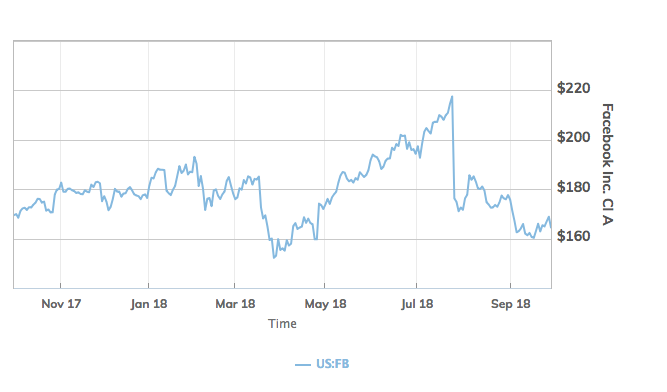 Facebook shares have dropped 23 percent during the third quarter, which ends Friday. Facebook said Friday it discovered a security breach that affects nearly 50 million user accounts. The issue was found by its engineering team on Tuesday afternoon. "We’re taking this incredibly seriously and wanted to let everyone know what’s happened and the immediate action we’ve taken to protect people’s security," the company said in a statement. The company says hackers exploited the "View As" feature on the service. Facebook says it has taken steps to fix the security problem and alerted law enforcement. "Our investigation is still in its early stages. But it’s clear that attackers exploited a vulnerability in Facebook’s code that impacted 'View As,' a feature that lets people see what their own profile looks like to someone else. This allowed them to steal Facebook access tokens which they could then use to take over people’s accounts. Access tokens are the equivalent of digital keys that keep people logged in to Facebook so they don’t need to re-enter their password every time they use the app." The Menlo Park, Calf.-based Facebook said it is taking three steps to ensure its users accounts are safe: 1. Fixing the vulnerability and informing law enforcement; 2. Resetting "the access tokens of the almost 50 million accounts we know were affected to protect their security"; 3. Temporarily turning off the “View As” feature "while we conduct a thorough security review." In addition, the Mark Zuckerberg-led company said it is taking the precautionary measure of resetting access tokens for another 40 million accounts that were "subject to a 'View As' look-up in the last year," bringing the total to 90 million accounts who will now have to log back into the service. Zuckerberg also alerted the breach on his Facebook page. On the conference call, Guy Rosen, VP of Product Management and the author of the aforementioned statement, said that the company is working with the FBI and said they update law enforcement "when we learn about these interactions." Facebook also said that it contacted the Irish Data Protection Commission about the breach. Highlights from the Senate Intelligence Committee and House Energy and Commerce Committee hearings with Facebook COO Sheryl Sandberg and Twitter head Jack Dorsey, including InfoWars' Alex Jones sparring with Marco Rubio and Rep. Billy Long drowning out a protester with an auction call. Neither passwords or credit card information were taken, Rosen said. Data that could have been taken included information that could be found using the "standard profile retrievable API," which includes data like gender, name or hometown, he said. Zuckerberg followed that up by saying the company is "taking it really seriously," but that he is "glad that we found this and we're able to the secure accounts." Rosen would not confirm whether the breach was state-backed, but added the hackers "did need a certain level in order for attacker not only get access but to pivot on the access tokens." Several Facebook users (including the author of this story) noticed the odd occurrence this morning and posted to social media wondering what happened. Matt Schulz, Chief Industry Analyst at CompareCards, said the breach is another reminder to keep accounts secure. The news comes just days after a hacker said he was going to delete Zuckerberg's Facebook page on Sunday. Noted Taiwanese hacker Chang Chi-yuan promised to delete Zuckerberg's account, telling his 26,000 followers that the event would be livestreamed on Facebook Live, according to The Verge. Chang said the event would happen at Sunday at 6 p.m. local time or 6 AM EST/ 3 AM PST. Facebook has suffered two data breaches in recent memory, including the Cambridge Analytica scandal, in which some 87 million accounts were compromised. The Cambridge Analytica scandal caused Zuckerberg to appear before Congress, led to a drop in trust in the company amongst its users and ultimately led Zuckerberg to apologize.